Each year, on Thanksgiving Eve, the boys in the brewhouse would concoct the most-anticipated Wednesday One-Off of the year: Apple Pie. 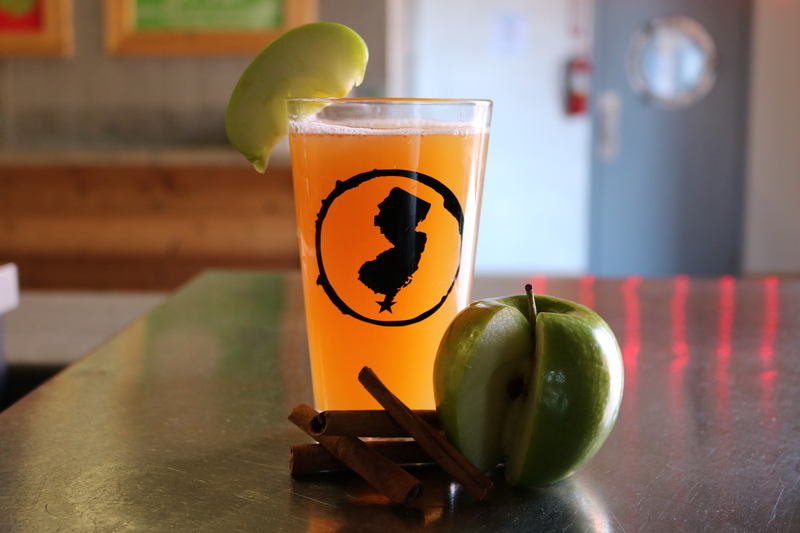 Essentially our fan-favorite Apple Bomb infused with nutmeg, allspice, ginger, and cinnamon, the single keg of this brew would kick nearly immediately, leaving latecomers clamoring for a taste. Last year, the dictum came down from on high — or, more accurately, from Hank — that we should do a full batch of Apple Pie. And there was joy in Cape May. Now, there’d be thirty full barrels of apple pie goodness to sip from the Tasting Room, from late October through the crisp, fall months. Many of you had good things to say. And those who didn’t are clearly un-American, for what could be more American than good, old Cape May Apple Pie? We’ve compiled some of the wonderful things people have been saying on Untappd. Check them out! It’s not just for dessert anymore! Apple pie. Mom’s stuffing. Aunt Ginny’s green bean casserole. Mashed potatoes and gravy. Aunt Yvonne’s cole slaw. Grandma’s homemade cranberry sauce. The whole family gathered around the table, patiently and calmly discussing politics and world events, while two purebred bloodhounds snooze by a roaring fire. Mom brings a beautifully-roasted turkey to the table and everyone gazes at it longingly and with love in their hearts for each other and the world at large. These are the essential ingredients to ensure that your Thanksgiving feast feels like it was conceived by Norman Rockwell. If this sounds nothing at all like your family, you’re not alone. If your family’s anything like ours, nothing ever gets discussed calmly, the bloodhounds are begging at the table for scraps, and it’s way too hot for a roaring fire. The food’s pretty close, though. If your family is a little non-traditional, we’ve got some ideas for you to jazz up your holiday feast with the addition of some Apple Pie. No, not the one your mother slaved over for hours — the one our brewers concocted by infusing Apple Bomb with the five spices of Mop Water: cinnamon, nutmeg, ginger, allspice, and whole-bean vanilla. It’s sweet. It’s spicy. It’s filled with apple-y goodness. We’ve conjured up some Thanksgiving-worthy dishes with Apple Pie that will make even Norman Rockwell wonder how he ever got through the holiday without them. This ain’t yo momma’s turkey, and it’s no more difficult than your usual bird. Just prepare your turkey as you normally would, but just before you pop that fowl bird into the oven, melt down a stick of butter and add a cup-and-a-half of Apple Pie. Drench the bird with that mixture and toss Tom the Turkey into the oven, basting as usual. Halfway through the cook time, dump another cup-and-a-half of Apple Pie over the bird and continue the process. Y.U.M. Here’s a great idea: some people like to use orange juice (or Grand Marnier) to moisten their stuffing before adding it to the bird, but how about using Apple Pie instead? The apple explosion of Apple Pie is a perfect complement to the holiday, and the spices in the beer will be excellent in your stuffing. Give it a try! Cran-apple is practically a no-brainer: two great tastes that Ocean Spray has been telling us that we love together since time immemorial. And they’re right! The sweetness from the apples is perfect against the tartness of the cranberries, and oh, those spices! Superb in any cranberry sauce — using Apple Pie would cut your preparation time in half. People have been mixing apple pie filling into their sweet potato casseroles forever — the crisp sweetness of the apples plays perfectly with the earthy sweetness of the sweet potatoes. And the fall spices and vanilla in Apple Pie are exactly what you’re looking for in your sweet potato casserole. AND you get the added benefit of beer! Perfect! Milk and beer? It’s a thing, trust us. One of our regulars… er… regularly… made Mop Water floats with a little vanilla ice cream. Apple pie ala mode is a Turkey Day staple… wouldn’t it be better with beer? Wouldn’t EVERYTHING be better with beer? Apple Pie is on tap now in the Tasting Room. Get a few growler fills and make it an Apple Pie Thanksgiving!